One of the main target species when spearfishing in Australia is the Snapper or Pagrus Auratus. The reason for this is they are very challenging to hunt if the fish see or hear you they will usually bolt off aggressively. 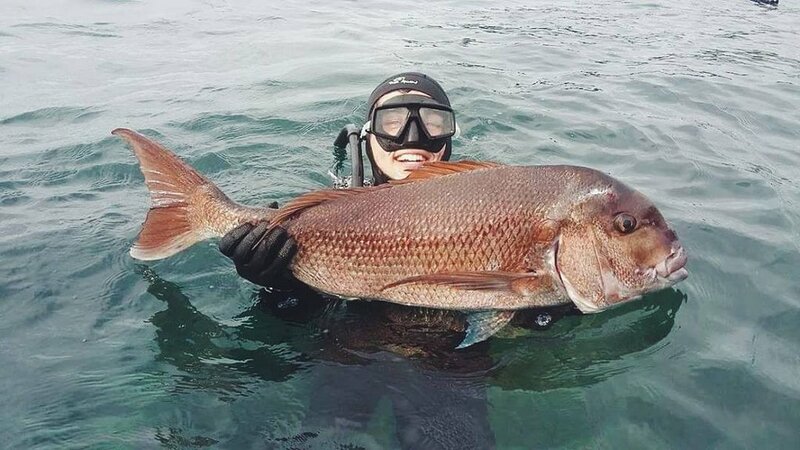 I was taught by one of the true masters of spearfishing in NZ, Geff Cookson aka Cookie, he is one of the OGs of a technique known as Snapper Snooping. When I was 15 years old he allowed me to follow him and watch with wide eyes soaking up every movement as he slithered his way around the coastline of Urupukapuka Island. This was one of the most memorable dives of my life and it gave me a headstart at hunting these elusive fish. Here’s how to spear a snapper. In simple form. 1. Where to find snapper? Find a piece of coastline that has these elements, rocky gutters, dropoffs, kelp/ weed, and patches of sand/ gravel. 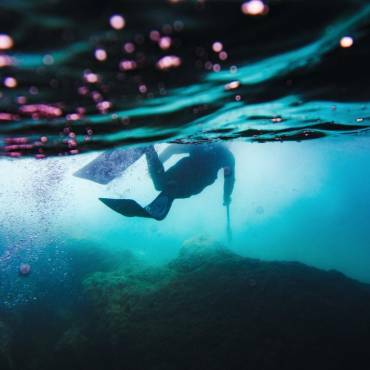 The main factor of the terrain is it must offer areas where the snapper can rest up in shelter, behind large rocks, drop offs and fingers of rock leading off into deeper water. Snapper does inhabit areas with flat bottoms but the second reason it needs to offer so many features is you need to be able to approach the fish without them seeing you. 2. How deep do I need to dive? Generally, I hunt Snapper in shallow water from 2m – 6m. Deep water locations can hold a lot of fish but it’s often harder to approach them as they can be hovering around off deep ledges etc.3. Choose a piece of coast no other divers have swum that day as most of the fish will be spooked. Also, it needs to be almost dead flat for best results, snapper snooping in swell is very difficult. You want to be swimming with the sun behind you, as the fish have a harder time spotting you. Swim hard against the shoreline, I mean have your shoulder touching it, this gives you shelter even when there is little shelter available. 3. How to find the Snapper? 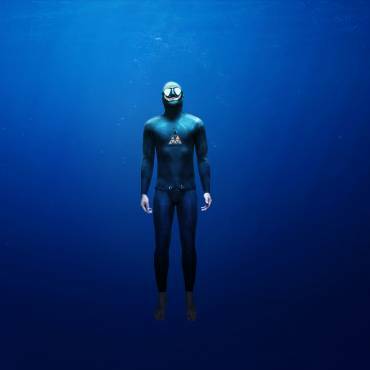 Now that you are in the right place, fin along the surface and dive down to check over every obstruction possible, as long as it offers enough shelter for you to hide behind. Things to look for a drop offs onto slightly flatter areas, large boulders or even just by lurking around a corner. Basically, you never want to be on the surface going over a drop off or around sharp corner. When you make your dives you will need to develop a smooth duck dive with minimal splashing. Remove you snorkel from your mouth so no bubbles escape and complete your equalisation before looking over a ledge. 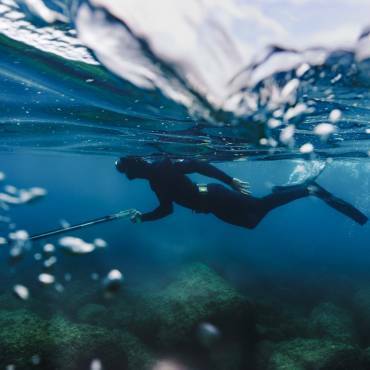 Approach the drop off or obstacle from a few meters back so you are out of sight, grab the kelp stems if available, hold you speargun close to your body and peer over or around the rock.If there is a fish there in range you may choose to take the shot if you are sure of it. Take it sooner rather than later as they are not often curious, unless they are smaller snapper. Don’t waste risky shots as you can injure fish or miss and create noise spooking other nearby fish. 4. Another option to snooping or something to use in conjunction to snooping is burleying. In NZ we generally use Kina or Sea Urchin. If you are in the right area and seeing a few Snapper even baby ones it can be very effective to find a likely area (e.g a drop off) and break open some Kina in a small pile. You then need to leave the area for 20 mins and then come back and approach the burley in the same manner as the snooping technique. 5. What specific equipment do I need? In Northland NZ we usually wear a 5mm Open Cell spearfishing wetsuit all year round. With lining on the outside and some knee and elbow padding. It is important to stay warm when spearfishing for Snapper as it is a low intensity, relaxed activity. Overweight your belt a little so you can get to neutral buoyancy earlier in the shallow water dives. Spearguns from 1m to 1.1m are ideal. In NZ we generally use a float line shortened for snooping and float. Reels are optional though and can offer more stealth. 6. Finally, the most important thing I have learned from gurus such as Cookie doesn’t take more fish than you need. If that means one pan sized snapper for dinner, bag one, be stoked and relax the rest of the dive.